Here I am in the Galapagos Islands. And all I can see is the ocean. But soon, the boat takes us close to Isla Lobos, where we’re told that we’ll disembark to go for a hike. My first real exploration. Our guide tells us to wear proper footwear due to the rocky paths we’ll be on and to keep to the paths. He explains that due to the all the islands being part of a national park, no one is allowed on any island without a park guide and that visitors must adhere to the rules. I’m nervous, excited and a bit overwhelmed with the thought that I might spot my first Galapagos Island creature. As we arrive on Isla Lobos, its hotter than I expected. The breeze is constant and the sun strong, and I’m soon sweating as gingerly step over black rocks that make up the path from the shore through short bushes, grasses and an occasional cactus or flower. I’m at the end of the group, having been distracted by the sounds of birds flying overhead and trying to capture the vegetation and then realize we’ve all stopped to see a nest. I wait, straining to hear the guide explain in softer tones what we were looking at – and to my surprise, its a blue-footed booby’s nest. 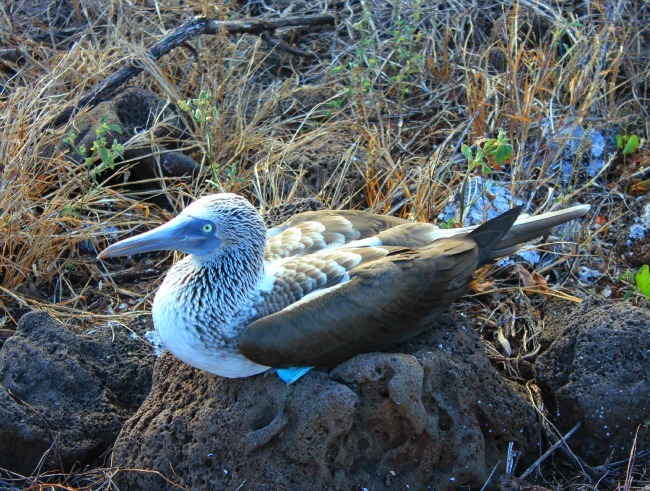 Although found along the Pacific coast, this bird became famous because of Charles Darwin, who studied it while making his historic reports of these islands. I was so excited to think that on my first day I could see this bird. And not only did I see this bird, I saw many in the upcoming days. I saw couples, singles, nests, eggs, and got so close I could have touched, but didn’t. Would Mr. Darwin have been proud of us? I hope so – since thanks to him, we all quietly crowded around to gaze at the blue footed booby couple and their nest.